Hinchliffe Holmes are delighted to offer for sale this incredibly well- presented two double bedroom end of terrace home situated on a no through road just outside of Northwich. The accommodation briefly comprises: Living Room. Breakfast Kitchen, Utility Room. 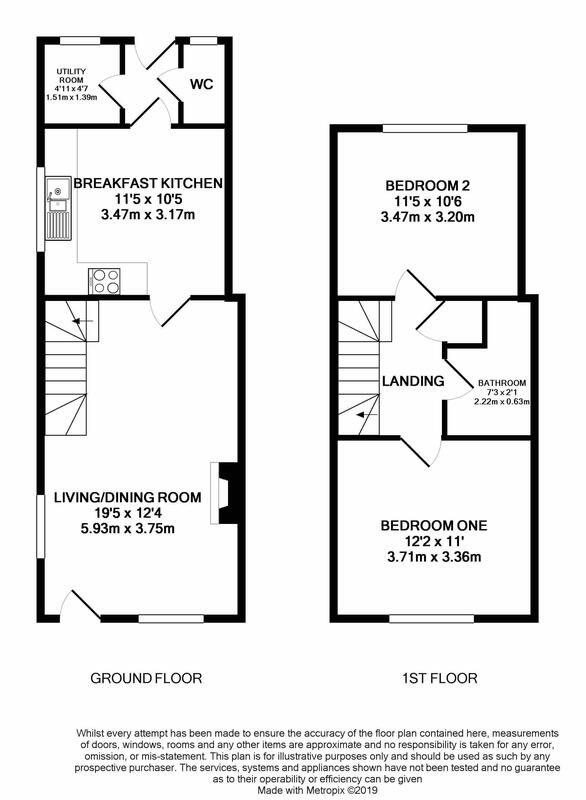 Downstair Cloakroom and to the first floor Two Double Bedrooms and Bathroom. Externally there is parking for numerous vehicles and a fully enclosed rear garden. Viewing is highly recommended. From our office on High Street, head East on Apple Market Street towards Weaver Square Shopping Precinct. After approximately 0.1 miles turn left onto Watling Street. After approximately 0.2 miles turn left onto London Road, take the second Dobells Road on the right and the property is on the right. UPVC double glazed windows to front and side with wooden shutters, inset downlighters, radiators, fitted carpet, TV unit with storage, gas fire with wooden surround and granite backing and hearth, understairs storage, stairs to First Floor. Tiled floor, fitted with a range of matching wall and base units comprising cupboards and drawers, base units with Korean work surface over, UPVC double glazed window to side, double oven with 4 ring gas hob, inset ceiling downlighters, sink unit with drainer and chrome swan style mixer tap, fitted fridge/freezer, integrated dishwasher, column radiator. UPVC double glazed window to rear, space for washing machine, space for tumble dryer, continuation of tiled floor, radiator, wall mounted combination boiler. UPVC double glazed opaque window to rear, radiator, low level WC with push flush, continuation of tiled floor, wash hand basin. Loft access, fitted carpet, airing cupboard and vent/smoke alarm. UPVC double glazed window to front with wooden shutters, radiator, fitted wardrobes, fitted carpet and original cast iron fireplace. Low level WC with push flush, wash hand basin with chrome mixer tap, bath with rainwater shower head over and separate chrome shower attachment, inset downlighters, extractor fan, glass shower screen, heated chrome towel rail. The garden steps down to a block paved driveway with access to the front and parking for two vehicles. There is an artificial grass area, mature plants and shrubs and this is an ideal area for outside entertainment being fully enclosed and private.